Devices like the BlackBerry Q10 and the BlackBerry Z10 have resulted in a resurgence in the popularity of BlackBerry cell phones. 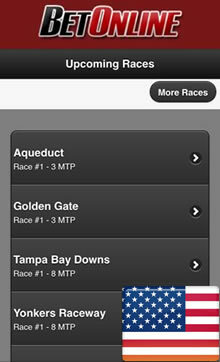 A growing number of horse racing apps are now also available for the RIM BlackBerry OS. The Blackberry is one of those devices that you either love or hate. One thing that they do have going for them is they get a bit of cult following with die-hard fans from across the globe. It’s for this reason why the device is still part of a lot of bookmaker’s strategy when entering the mobile betting industry. Its hardly breaking news that the Blackberry seems to be a device that is struggling to keep up with their competitors, but for the mean time at least, there are numerous betting companies that are still producing horse racing apps specifically for the Blackberry Q5 or tables like the Blackberry Playbook. Paddy Power are an Irish institution whose success has largely been due to their excellent coverage of horse racing over the past 90 years. While you won't be able to find a a native version of the Paddy Power app in the BlackBerry App World, the web-app looks and functions in exactly the same manner. The homepage of the Paddy Power app features highlighted races for that day. The "Next Races" give quick access to upcoming races in the US, Ireland, UK, Australia and France. The Paddy Power app has a racecards that's packed full of information to help punters pick a winner. There is a form guide along with info on the trainer, jockey, horse age/weigh and much more. Independent racing tips are provided courtesy of the Racing Post. Watch live racing from the United Arab Emirates, England, Ireland, Scotland and South Africa on your phone. Regular horse racing specials and promotions make this racing app invaluable. If you are a U.S. citizen who wants to place a bet on a horse race from a BlackBerry your options are pretty limited. While there is a decent selection of U.S. friendly online bookmakers available, few of them have invested heavily in developing betting apps to compete with their European counterparts. Thankfully things are slowly improving thanks to the arrival of the BetOnline betting app, which goes someway towards bridging the gap. BetOnline Mobile is a web app so you just install it from the browser of your BlackBerry. After that just select "Horses" from the top menu to be brought to the main mobile racebook section. Every thoroughbred and harness racetrack in the United States is covered. There's a weekly racing calendar plus dates of every major upcoming race. Handicapping and Racing Past Performance (PPP) info is also available. Futures betting is available on every major race from around the globe, including the Kentucky Derby, Preakness Stakes, Melbourne Cup and English Grand National. To sweeten the deal, BetOnline offer daily rebates of 5% on all straight bets plus a 25% bonus on your first deposit. Mobile betting is something that’s seen a huge increase over the last few years and a device that has been targeted fairly heavily is that of Blackberry. As there are so many forms that the Blackberry comes in, it’s often tough for companies to produce a product that will fit all devices. This is why some companies actually don’t target the Blackberry at all, but the ones that do will likely be apply their product for the ones that include touch screen or at least those with larger screens on offer. Whilst these apps are dedicated there are ways in which you can get around bookmakers not having dedicated apps. Most sites are accessible via the browser on the Blackberry and it then in turn takes you to a mobile ready page. This is essentially the same as using the app, except it loads within your browser. Some people would actually argue this works better than an app as its much more stable to use. The race card has been an area that a lot of bookmakers have tried to really improve. It’s important these days for a bookmaker to make these much more detailed than years gone by. They are all accessible from your Blackberry device and should be much more than somewhere to simply place your bets. The depth of a race card will vary depending on which bookmaker you use. It’s not uncommon to find everything from tips, synopsis, predictors and even live streaming, direct from the race card. The availability of betting tips from your Blackberry is actually pretty much endless. There are dedicated tipping apps such as OLBG (Online Betting Guide) that you can download and keep checking back for some of the best bets in the business. As with any tipping service though, we do highly recommend that you mange to form your own opinion, rather than solely relying on others. It’s worth noting that even though the number of dedicated apps for your BlackBerry that include tipping services are pretty limited, there are dozens that include tips of some sort. In fact, most of the bookmakers are likely to include tipster sections or at least links to their site where columns are written by some high profile names from within the horse racing industry. Blackberry gambling apps are how available for playbooks and phones. Live streaming isn’t all that new to horse racing with some bookmakers having their service up and running for years now. It is however, quite new for mobile devices and especially BlackBerry. The differentiating screen sizes and formats means that streaming services on BlackBerry’s is actually quite limited compared to most of its rivals. For the devices that streaming is available on then you get quite a few options to choose from. Your first port of call will be directly via the betting app. As we mentioned, some bookmakers do include this for horse racing and some don’t. The ones that do will likely be free, but may require you to wager on that race. Other options include subscription packages, which range in both quality and price. The odds comparison app is likely going to become your biggest friend when it comes to betting on horse racing. Whilst there are dedicated apps to choose from, the Blackberry allows you to peruse a number of websites that will do all the hard work for you. The likes of Oddschecker.com and even social media outlets are going to be the best and cheapest way of finding out the best prices for the race you want to bet on. Dedicated apps are tough to come by, but we must mention OLBG (Online Betting Guide) who have actually made more of a tipping community out of their app than anything else. The tips vary from seasoned professionals to everyday folk just looking to casually bet on horse racing. The best thing is it allows you to see what other people may be thinking about a certain race and also tips from tipsters who are running hot or cold. You can choose to follow these guys religiously or merely just compare them to the bets that you have already come up with if you choose. We found that when using our Blackberry to find out the latest news and results, few apps were quicker than simply loading up the likes of Twitter and Facebook. Making dedicated streams and feeds will allow you to see information from a much more dedicated source, rather than having to sift through an everyday account. Its also about as instant as you are going to get, with the dedicated search options meaning you can quickly find information on the specific event you are looking to bet on. A computer predictor is basically a virtual way in which you can see which horses are going to run well in certain races. Its taken from an algorithm that includes a number of factors to see how the race might pan out. They have become extremely popular with causal bettors and can now be found on a number of bookmaker apps. 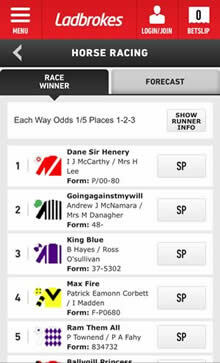 The best of its kind can be found on the Racing Post app, which is free to download on Blackberry, but may require a subscription for some services. It won’t take long looking around a bookmaker to see that the majority offers up a range of mobile specific offers. One of the best things about it is that if the app is on offer to Blackberry users, you will be able to take them up on the offer of mobile promotions. The range of promotions that you can get will vary, but it should yield a fair amount of value for your troubles. Is the Blackberry market set to increase? If the company continue on this downward curve then it’s unlikely to get better for Blackberry users. The range of apps on offer is still quite high, but we wouldn’t be all that surprised to see features and promotions start to come to an end for the Blackberry user. Can I get apps direct from the Blackberry store? Some betting apps are on offer from the Blackberry store, yes. They will range though, a lot more than that of the Apple or Android store and will likely not include as many dedicated bookmaker apps.